I was planning to write a general guide to beating the top decks in Modern, as alluded to last week. However, my discussion kept circling back to Death’s Shadow. Every time I talked about how various decks were constructed, it inevitably involved Shadow. The strategy discussion? Even as I described picking apart Counters Company with Lightning Bolt, my thinking returned to Death’s Shadow. Once I noticed this, I couldn’t stop noticing it, couldn’t stop puzzling about it, and now I’m perturbed by it. The metagame and Death’s Shadow have become inextricable in my mind. I’ve been trying to unravel how this happened, but it just seems to be me chasing my own tail. Care to join me as I work my way through? Luis Scott-Vargas recently set off a firestorm with his call to ban Death’s Shadow. Agree with him or no, a Hall of Famer making such an unequivocal statement is significant. His argument is that Grixis Shadow is too efficient and resilient for Modern, and it is gradually going to take over. It plays a lot of one-mana disruption and wins with one-mana beefsticks. You have to set them up, but that really isn’t a problem for Grixis. The anti-ban crowd is up in arms over this video, despite LSV making it clear that Shadow doesn’t actually require a ban. I am conflicted. On the one hand, I agree with LSV’s points about Grixis Shadow. On the other, there doesn’t appear to be a problem. I see some troubling signs, but it is far too early to be definitive. I’ve been over this a number of times, but I’ll say it again just to be clear. Grixis Shadow is the best deck in Modern. The evidence is pretty overwhelming. The fact that it didn’t put a copy into the Vegas Top 8 is beside the point. The deck is powerful, reasonably resilient, and relatively consistent. I’ve compared it to Legacy Grixis Delver, which is also on top of the Legacy metagame. By itself, this is not a problem. It is natural for there to be a best deck in any format, and for that to prove especially true while the deck is relatively new. We’ve seen it before with Tron, Bant Eldrazi, and Infect. Eventually, the metagame will respond, answers will be found (assuming you’re not in Standard and they just don’t exist), and other decks will regain ground. However, one cannot count on that happening every time. The Counterbalance/Sensei’s Diving Top lock had existed in Legacy for years but never really took off until Terminus was printed. It quickly established itself as a powerhouse, particularly in the hands of Joe Lossett. In 2014, it was recognized as the format’s boogeyman. By 2015, Miracles was the unchallenged best deck in Legacy. And there it sat until Top was banned earlier this year for being the best deck, year in and year out. Was there movement, diversity, and innovation during its reign? Certainly, but always in the context of improving your Miracles matchup. While Legacy was mostly healthy, the format was clearly warped, and all decks orbited Miracles. Ultimately, this is the concern with Shadow. Not that it’s too powerful, but that it is warping Modern. As I’ve said, Grixis Shadow most resembles a Legacy deck. It is based on being as efficient as possible and plays as many one-mana spells as possible. Much of the deck is interactive, with full sets of Thoughtseize and Fatal Push in every deck alongside some number of Stubborn Denial, Inquisition of Kozilek, and Terminate, with Snapcaster Mage to double up on interactivity. This isn’t a problem by itself—players like interactive decks. It’s one of the great appeals of Magic. Shadow intends to shred its opponent’s hand with discard, then drop a 5/5 or thereabout for one black mana and ride it to victory. A generally fair strategy. The problem with all of this is speed. The interaction is very one-sided in most matchups. Shadow is proactively disrupting your gameplan, either by breaking up your win condition or invalidating your answers. As a result, Shadow almost always decides how the game will be played. If they can clear the way for an early win, they will do so. If they cannot win quickly, they’ll simply grind you out. This flexibility and information advantage was seen before, when Gitaxian Probe was in Infect. Combine the cheap interaction with the information, and the fact that all of this is filling the graveyard for Gurmag Angler to come down as early as turn two, and it becomes very hard for decks to actually play against Shadow. I don’t know. On the one hand, I like the fact that the best deck in Modern is an interactive one. This isn’t like Infect or Amulet Bloom, ships sailing past their opponent in the night. Interactivity and actual gameplay is a good thing. The question is whether or not it’s too good a thing. It is hard to match the proactivity of Grixis Shadow, and as a result, even answer-heavy control decks can find themselves scrambling for answers on a very fast clock. Shadow simply picks their hands clean of answers, then asks if they can find more before dying. It is possible, but it feels like they’re warping themselves to fit into Grixis Shadow’s orbit. That’s worrying. One of the arguments that keeps coming up against a ban is that Grixis Shadow is a hard deck to play correctly that rewards skill. This means that only those players who are actually good are winning with the deck, and that the format should reward skill. This strikes me as extremely elitist and fairly facetious, but I will concede that the deck is hard to play well and that small sequencing errors often decide games. However, everyone said the same thing about Amulet Bloom and it was still banned. Miracles was also very hard to pilot correctly and dominated for years. It didn’t matter that Joe Lossett could resolve his Top activations in less than a second or that it had taken him years to get to that point. What mattered was the impact of the deck itself on the format. As a result, I don’t believe that the difficulty of a deck should factor into ban considerations. Very hard decks may never put up the numbers to warrant a banning, but they can still be unacceptable. Amulet Bloom certainly was a very powerful deck that really didn’t play Magic, but it was so easy to misplay with it and lose that fewer players sleeved it up than “should have.” The real question is not how well the cream does, but the normal milk. If average players can pilot a deck well enough to consistently win, and the best make it look easy, we have a problem. Don’t fixate on the perceived difficulty; ask yourself if the deck is powerful enough that even when you don’t play optimally you will still consistently pull through. I don’t think Shadow is there, but I feel like I should be adding yet onto that statement. Is the Format Just a Satellite? The real concern for me is the format becoming defined by Shadow the way Legacy was by Miracles. Is the deck beatable? Absolutely. Do you have to adapt your gameplan because of Shadow’s existence? Maybe. The impact is hard to see in the wider metagame, but I do see it in the other decks I intended to discuss today. The fact that I am seeing it at all does set off the warning bells. Remember, Splinter Twin similarly demanded that you adapt to its presence or die, and that was banned. I didn’t agree with the decision, but that was Wizards’ justification. The new Counters Company deck has eclipsed Abzan Company. Utilizing the Vizier of Remedies/Devoted Druid infinite mana combo in tandem with the Kitchen Finks/Anafenza, Kin-Tree Spirit/Viscera Seer infinite life combo appears to have greatly improved the deck by turning it into a dedicated creature-combo deck. It was formerly a Gavony Township beatdown deck that sometimes won via combo. The deck has finally started putting up results after months of sliding down the metagame charts, but I don’t actually believe that’s the new combo’s doing. At least against the decks I play, Counters Company is much worse than Abzan Company. Abzan and Counters Company inhabited different worlds, and as a result, the Counters deck is far more fragile than Abzan could be, even though it wins (outright wins, not the functional infinite-life win) on turn three far more often than Abzan ever did. 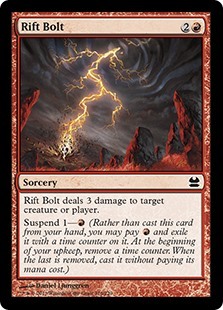 Notably, Lightning Bolt is at an all-time low because it’s ineffective against Grixis Shadow. Abzan Company was full of Tarmogoyfs and Wall of Roots to dodge Bolt, which forced it to play a slower, value-based game. Counters is filled with excellent Bolt targets, but it doesn’t matter because nobody plays Bolt. Death’s Shadow has forced players to play hard removal instead, which limits the options to Path to Exile, Fatal Push, and Terminate. This shift makes the formerly unimpressive creature combo a far more attractive plan than ever before. All thanks to Grixis Shadow. Similarly to Company decks, Eldrazi Tron has replaced traditional Gx Tron as Modern’s big-mana deck. Dropping hordes of undercosted spaghetti monsters early is a really good strategy. Couple this with the power of Chalice of the Void and supersized Walking Ballistas and you’ve got a powerhouse… that is in many ways worse than Gx Tron. Tron was terrifying because you could always lose to the top of their deck. Even if you survived the initial bomb, Tron had so much land search and cantrips that they would find more and more until you could take no more. The deck could shrink itself so rapidly that you’d be facing just bomb after bomb very quickly. Eldrazi Tron can’t do that; it only has a few Mind Stones and Expedition Maps. As a result, if you survive the initial onslaught, Eldrazi Tron struggles to recover. The key to Eldrazi Tron’s success is Chalice being good. Modern has traditionally had too high a curve for Chalice to really be effective. The key cards always cost two or more and Chalice is only outstanding when you’re shutting down one-mana spells. While every deck had some, they weren’t particularly important. The fact that you can’t readily Chalice on turn one is another factor. Grixis Shadow is built around one-mana spells, and its efficiency is encouraging other decks to follow suit. This means that Chalice has plenty to prey on, and if you have impressive enough follow-ups you can lock your opponent. The fact that Eldrazi Tron is based on creatures rather than planeswalkers is another consideration, since Gx Tron is really hurt by Stubborn Denial. I don’t think Eldrazi Tron is actually better than traditional Tron, but it possesses the right tools for a Shadow metagame. Every Shadow deck plays a full set of Fatal Push, and some number of Kolaghan’s Command and Terminate. Two years ago, everyone assumed that this combination in the new Grixis Control lists spelled the end of Affinity. They were wrong. This belief led to players cutting their Affinity hate, and the result was one of the best seasons the robots ever experienced. The thinking came full circle in Las Vegas. Between the rise of Grixis and the belief that the format had just passed it by, everyone had simply written Affinity off. This came back to bite everyone and three Affinity decks made Top 8. Whether this will be sustained is an open debate, but what isn’t is that Affinity benefited from the focus on Grixis Shadow. It was one of my sideboarding rules for a reason: don’t assume others will take care of Affinity for you. Burn has been a Tier 1 deck for a long time. This isn’t surprising in a world of fetch/shockland manabases. However, a lot of previously good matchups have disappeared, and you’d think that Burn would drop off. Jund was good for Burn, as was Gx Tron, and both are now gone. In their place, Chalice decks and combo decks have risen, and neither are good news for Burn. Yet the deck remains top-tier and arguably the third or fourth best deck, thanks to Grixis Shadow. Burn is not vulnerable to discard and preys on decks that self-harm. Now that Burn players are adjusting their sideboards with Shadow in mind, they’re able to take advantage of the meta and are arguably keeping Shadow in check. Everything I’ve said suggests that Shadow is beginning to warp Modern around itself. Card choices are being made specifically because the deck exists, and deck shares are rising and falling based largely on their Shadow matchup. This is indicative of a Miracles-like metagame forming. On the other hand, it is far too early to tell. The deck has only existed a few months; it took years for the impact of Miracles to crystalize in Legacy. For all I or anyone knows, it might be temporary. In a few months, Shadow may be dethroned as players develop the strategies necessary to cope. The PPTQ season begins soon, and I suspect those results will really determine whether Shadow has what it takes, or if this was all hype and confusion. LSV mentioned that new cards may well tip the scales on Grixis Shadow. This is always possible, and we haven’t seen all of Hour of Devastation or Ixalan yet. I don’t think that Claim // Fame is that card, as it’s very similar to Orzhov Charm and that really didn’t catch on for Shadow players. Still, we need to wait and see. On an unrelated note, I have a question for any Gifts Storm players out there: is the transformative sideboard with Madcap Experiment and Platinum Emperion any good? The split between that and traditional sideboards seems even. I’m comfortable enough with the Storm maindeck to start my experimentation with Preordain but I need to work out the sideboard. Any insight on this front is appreciated. When splinter twin got banned, there were four versions of it: UR twin, jeskai twin, tasigur twin, and temur twin, of the four, only one played Thoughtseize. Today death’s shadow has abzan, grixis, jund, and esper. And guess what? Every. Single. One. Of them plays four Thoughtseize, but it doesn’t stop there, they also play 2-4 copies of Inquisition of Kozilek as well. This is in a nutshell why I would rather play against splinter twin over death’s shadow. I’m fine with decks having two of the following: targeted hand disruption, removal, and countermagic, but I cannot stand any deck that runs all three. Sounds like you just don’t like fighting black based control. Some people hate countermagic, some hate hand control. I hate fighting planeswalkers. Idk why it just bothers the hell out of me. Splinter Twin had lots of cards that were the same across all decks too. Pestermite, Exarch, and Twin was about 10 cards, but they usually ran a lot more similar cards as well like counterspells and bolt. So Twin decks actually looked more similar than Shadow decks. As far as playing against interaction goes… I’m sorry you don’t like interaction, but keep in mind most people enjoy interactive Magic the most. Having a goodstuff midrange deck at the top is my idea of an ideal metagame. Really the only valid argument for a Shadow related banning is metagame percentage, which I would guess is around 20% for banning, because although Twin was lower the primary reason for its banning was to shake up the upcoming Pro Tour. Correct me if I am wrong, but doesn’t grixis shadow simply break down against leyline of the void? In my experience grave hat eis good against them but hardly backbreaking. It’s much better against the jund version. Not as much as you think. The delve creatures are gone as is the Snapcaster Mage value plan but the Delver-esqe plan of riding Shadow itself is intact, and since that is often their plan A anyway they still get there a lot of the time. Going long yes, Leyline is huge game but for that initial few turns it may not matter. Arent decks always going to “warp” around the most competitive decks? I really think if youre going to have any bantalk about ds then you need to bust out the criteria here and ask what its breaking. Your foray into people having to play decks that can deal with ds seems obvious. If your deck cant handle ds, eldrazi, coco and burn you’re probably in trouble. And while you tell us to forget the fact there were zero ds decks in a top 8 that seems a little rich. Im pretty sure constant top 8s were a big part of the rationale in the twin ban (loathe as I am to use that as a good yardstick). Isnt grixis shadow just the new jund? Fair interactive deck with game vs everything. Disruption and card advantage with cheap efficient beatsticks. Tough to hate out via sideboard. 1- is it fair to compare a deaths shadow banning to miracles as miracles was supposed to have been banned for the poor tournament organizers rather than format health? 2- where do you draw the line between a format being inbred to combat an archetype and a healthy format with a fairly solved best deck? I don’t feel like deaths shadow is good enough at the moment to justify a banning. As for counters company, I have been playing the bant knightfall version and the number of times that my opponents will kill a devoted druid over a knight of the reliquary is astounding. That version seems more resilient than the current abzan build. I don’t think Grixis Death Shadow oppressive just as usual the people complaining have the loudest voice. As a storm player I actually feel like I have a much worst match up in abzan mid range and 4 color death shadow. If anything modern needs an unban not a ban r I think the madcap emperion plan is bad really bad. Any sideboard plan that takes up so many spots is bad IMO. I don’t like leyline of sanctity in the board for the same reason. It doesn’t sure up bad matches for the most part. Going more in on the Empty the warrens plan is better. it can be a lot faster and 8-12 goblins on turn 2 is enough to beat most decks without mass removal. I have been testing out postmortem lunge, but haven’t gotten enough games to try it out yet. Yes, that would be fine! Please just make sure you credit us with a link back to the site or the like.